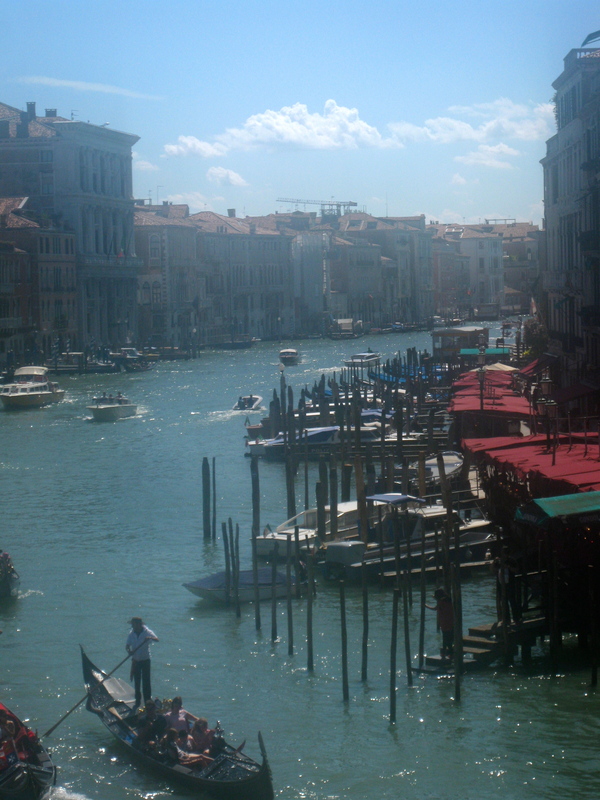 My next few blog posts will be about a personal experience I am having in Venice, Italy. The trip is primarily a writing trip, although that gets confusing with the EU security people, so I just say: “I’m traveling… to travel.” Well that’s entirely true as well. 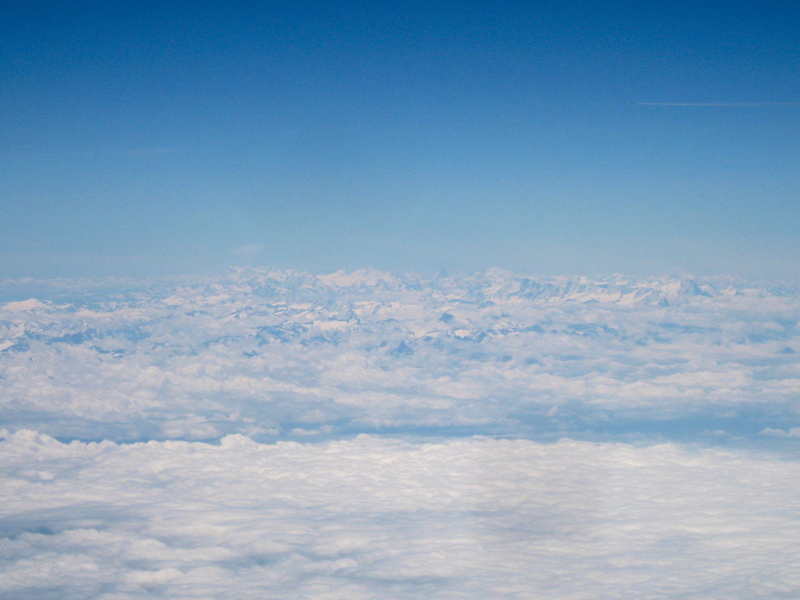 The wonder-lust was setting in, and still I couldn’t believe that I was on a plane to Venice. 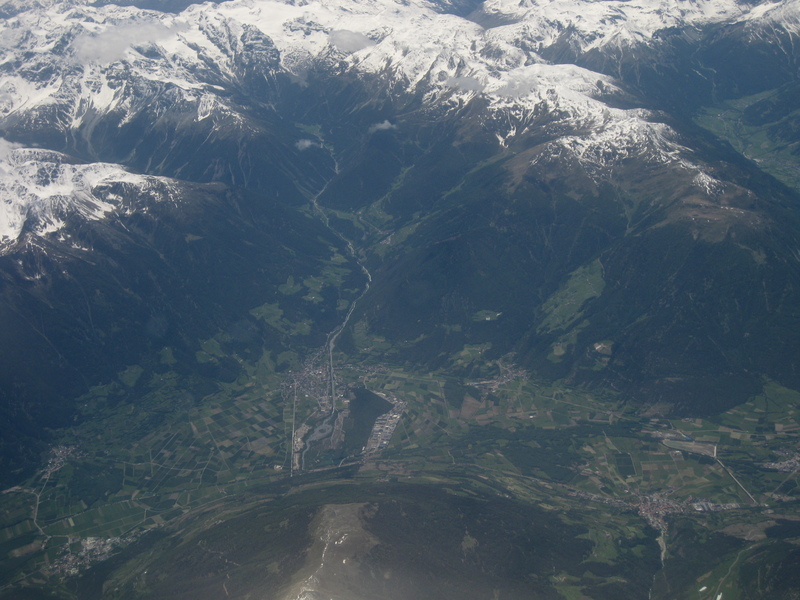 Well then my aunt (who originally asked me to accompany her in October of 2011) pointed out that since we were flying from Dusseldorf to Venice, we would probably fly over the Alps. After that began an agonized wait to find out if we actually had a window seat. No. The middle seat and the aisle seat. But a sweet German lady who was supposed to have the window seat asked if she could have the aisle seat since she had a problem with her hip. That landed me right next to the window in the front row of the plane. The countryside of Germany was passing through in patches underneath the clouds, farmlands, little splotches of trees here and there, straight roads, and lots of lakes. I fell asleep here and there, especially when there were too many clouds to see. Then I woke up, and was inspired to look ahead. And I really did. I could have recognized them anywhere, just from the pictures. And I was concerned about cloud-coverage. The Alps rose high above the clouds in jagged points, and my feelings towards mountains spiked up to a whole different level. In the meantime, the flattened countryside suddenly gave way and we were above the Dolomites, which were in their turn snow capped and beautiful. The clouds cleared, and we looked down into valleys with villages nestled into them, and rivers flowing down the mountains. I felt like running to the emergency exit and parachuting out, finding the Swiss Alps, and living my own idea of a Johanna Spyri book. So the plane flew on, and eventually we landed. And eventually got a bus, which eventually made its way into the city, and we got the water bus, which eventually, after many stops and jolts, got us to Rialto, where we found a phone store (to buy a phone card) not to mention the 3000 tourists crowding the bridge. But finally we made our last stop off the Grand Canal, and a short Italian man made his way towards us and asked if we were the people staying in the apartment. And we were. We followed him through a confusing maze of squares and alleys, and in Santa Margherita we were at the apartment. The further we walked into the city, the more I saw, increased my astonishment and my disbelief of what was happening. Every time I leave the country I think: “This can’t possibly be happening to me. Stuff like this doesn’t happen to people like me, to small people.” But God blessed me in measures beyond my belief, and here I am. The place we’re staying has marble floors and steps, copper basins for the kitchen sink, Ionian pillars outside the doors leading to the courtyard… and a wall of glass that looks out into the courtyard. Narrow, double doors into my room, and on the headboard of the bed is an elaborate, somewhat gothic piece, which includes a painting of Mary and Joseph and Jesus on their way to Egypt. High ceilings everywhere, and the curtains are long, deep red. There are so many different things in this room alone, so many different stories in each gothic or artistic ornament that I am still finding new things everywhere in this small space. Last night as we were walking along some of the canals, I said: “It’s hard to believe we haven’t always lived like this, in a way. I feel like we’ve always had the pizza, and the gelato, and watched the people go by.” In a way it was true, but I think it was the feeling of comfort, of feeling like you could very easily get accustomed to a certain life style. I woke up at 12:30 in the afternoon the next day (which is today). For breakfast, on the terrace, we had coffee yoghurt (which is much better than it sounds) soft brown bread with apricot jam, soft asiago cheese, fresh peaches from the market stands down the street, and tea. After walking around the city for a few hours, we came back and ate some more bread and cheese, with fresh cucumbers and tomatoes and peas also from the markets. The peas we took out of the pods, and by the time we were finished had a whole bowl full of empty pods. They were delicious. I don’t exactly know what to expect from this trip. I have a line from Siddhartha by Hermann Hesse running through my head that says: “Seeking means having a goal and being blind to everything else. Finding means having an open mind.” And I think that’s what I want to have, is an open mind. I feel like the more open I am, the more I learn. I also know that stories lurk in very narrow corners, in a single corner, and there are many of those here. It’s not so much the broad perspective, although that does serve for context. But for a poem, or a story, very little is needed. In the courtyard alone are probably about thirty or forty poems that could be written (but probably won’t be.) Little things. There are only so many words and images you can use contextually for a single poem. This opens the horizons to a great measure. In the meantime, I have felt so jet-lagged and exhausted that I’ve even begun to question my identity as a writer. To walk into the churches and be shocked and stunned by the beauty inside is to feel an evaporation of the all the poor stories I ever had in my head. It’s comforting to know that’s only a temporary feeling. The inspiration usually hits later. For those of you who are looking for updates on my trip to Venice, I’ll try to remember to take and post pictures. I’m not a photographer, so excuse the quality and the angles and exposure. At least you’ll get an idea of what it’s like. I did order gelato last night in Italian. It was an exciting moment in the life of Ruby Hopkins.